For the last couple of years I have been thinking about changing up our Christmas tree decor. We've had the same red, gold and white star-themed tree for the past 17 years and I am ready for a change! I actually can't believe it's been that long! So this year I decided to take the plunge and give our tree the little makeover it deserves. It was all inspired by this darling wrapping paper I found on a late night grocery run. I bought a few other ornaments, as well, and figured I'd try to re-use some of the other things I have. 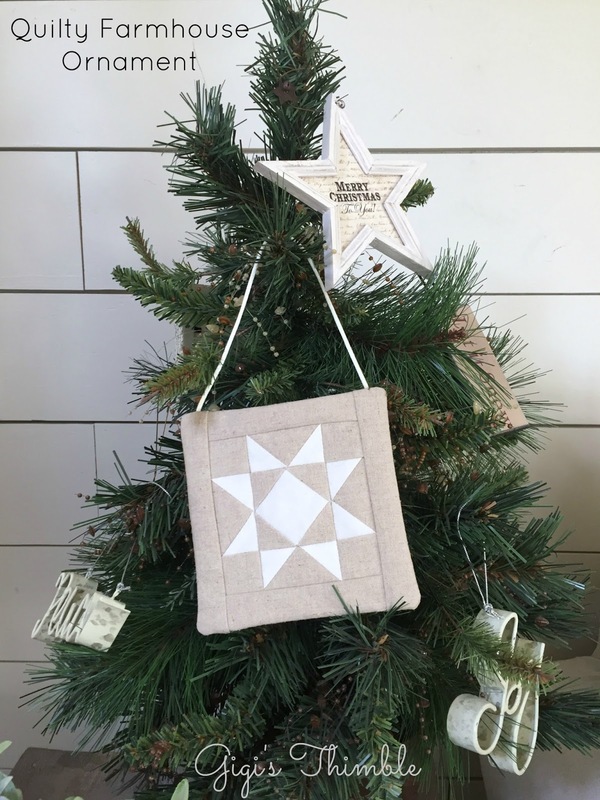 Some of my favorite ornaments from our last tree were these red and white star ornaments. I bought them many years ago and always really liked them. They kind of suit me, don't you think? 1. Fold the 1-3/4" x 1-3/4" cream square in half both directions to mark the center of each side. Fold the tan triangles in half to mark the center of the long sides. 2. With RST, line up the center mark of a triangle with the center mark on the square. Sew together. Repeat on the opposite side. Press the seam allowances toward the triangles. Trim excess. Repeat on the remaining two sides of the square. Trim the block to 2-1/4" x 2-1/4". (This should leave 1/4" between the points of the cream square and the raw edge of the block. See photo below.) Set center block aside. 3. Place a 1-3/8" x 1-3/8" cream square on the left end of a 1-3/8" x 2-1/4" tan rectangle with RST. Sew on the square diagonally, as shown below. Trim 1/4" from the stitching line. Press the seam allowance toward the triangle. Repeat on the other end of the rectangle. Make 4 Flying Geese units. 4. 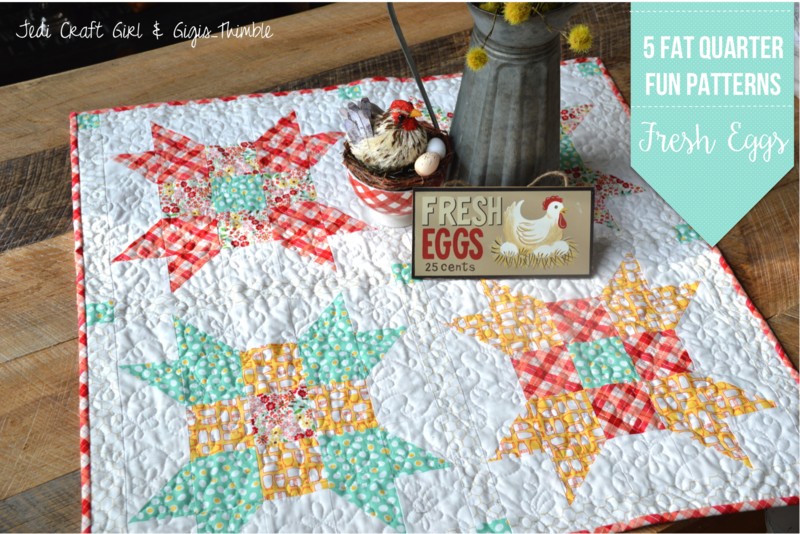 Sew a Flying Geese unit onto opposite sides of the center block. Press the seam allowances open. 5. Sew a 1-3/8" x 1-3/8" tan square onto each end of the remaining 2 Flying Geese units. Press the seam allowances toward the squares. 6. Sew the units from step 5 onto the block. Press the seam allowances open. 7. 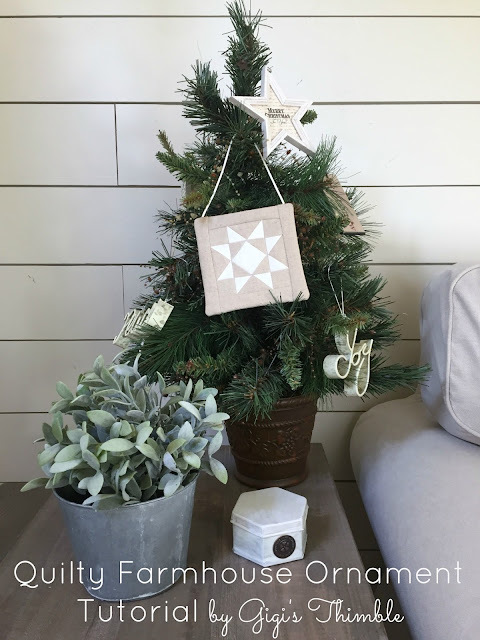 Sew a 1-1/4" x 4" tan rectangle onto opposite sides of the star block. Press the seam allowances toward the rectangles. 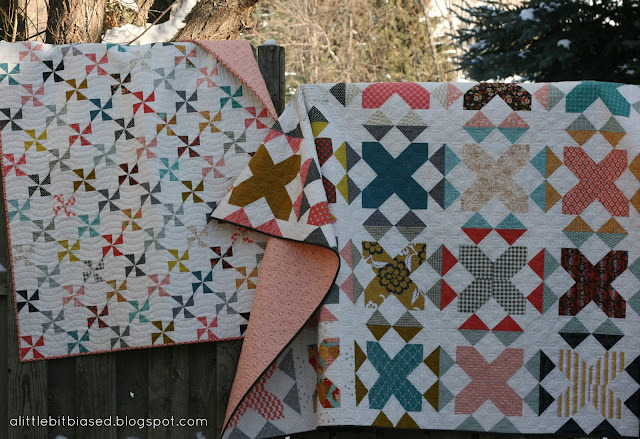 Sew a 1-1/4" x 5-1/2" tan rectangle to each of the other two sides of the block. Press the seam allowances toward the rectangles. 8. Place the 10" silk cording on top of the block as shown below (about 1/4" outside each seam on the border). Stitch ends in place. 9. Place the 5-1/2" x 5 1/2" tan square right side up on a table. Then place the star block on top of the tan square, right side down (make sure the stitches that secured down the cording are at the top edge). Then center the 5-1/4" x 5-1/4" batting on top of the block. Pin the 3 pieces together. Sew around the pieces leaving a small opening at the bottom. 10. Clip the corners to reduce bulk. Turn the ornament right side out. Use a dull instrument to poke out the corners. Press the edges. Stitch the opening shut with coordinating thread. I can't wait to put up our Christmas tree this year to see my Farmhouse Christmas tree vision come together! Thanks for stopping by today. I hope you enjoy this tutorial. Please tag me on Instagram @gigis_thimble if you make some of these Quilty Farmhouse Ornaments! I'd love to see them in your home! I'm always snapping screenshots from my phone of quilty inspiration I see on Instagram. Do you do that too? They're usually pictures that inspire me because of a color palette or because it's a beautiful version of a pattern I want to make someday. So I started an IG hashtag called #quiltyscreenshots to keep track of all of them and let the makers know they've inspired me! You're welcome to play along too, if you're on Instagram. Tag me @gigis_thimble if you decide to do a Scrappy Screenshots post. 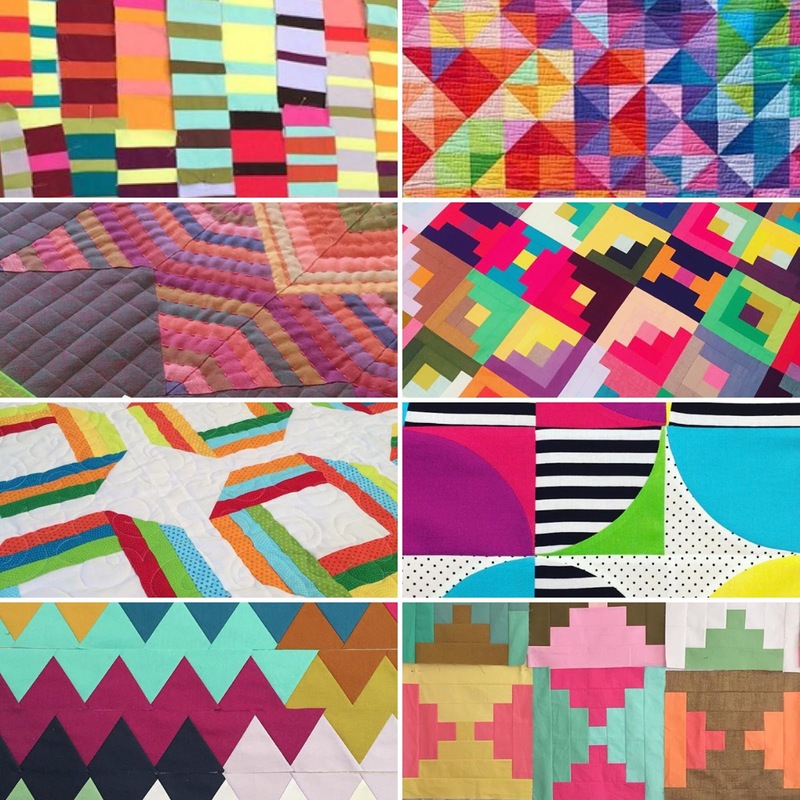 Below are some pictures of solids quilts that I posted on there recently that really caught my attention. As you can probably see, the second quilt down in the right-hand column really spoke to me. 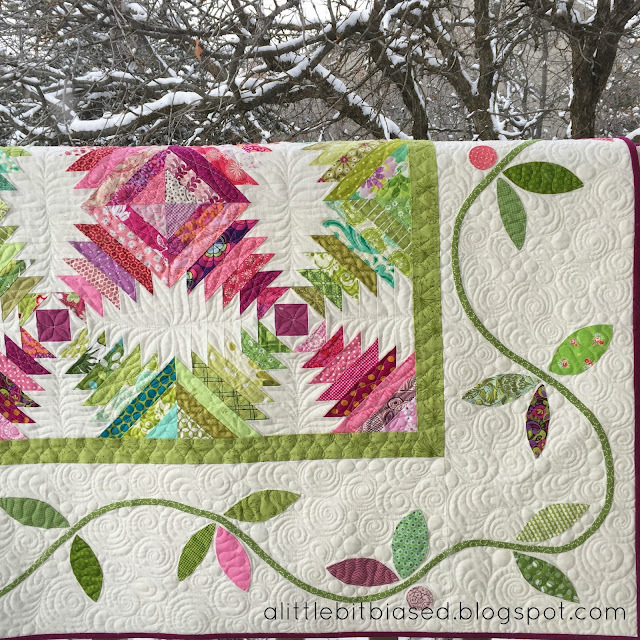 If you look close you'll notice that the maker, Tricia Royal of Bits and Bobbins had fun playing with color. I love how she used varying shades of one color in certain areas. It really gives it a playful "Tetris" feel! I can't stop looking at it! With some leftovers I recently acquired from a new "solids" pattern I'm working on, I decided to start a new project inspired by Tricia's quilt. I decided to go small. These blocks finish at 3.75". Since I had a lot of strips already cut and I love paper piecing, I decided to paper piece these little babies. Some people ask why I would paper piece something so simple? I just like that I don't have to pre-cut anything with paper piecing! I just grabbed my strips and my pattern and dove right in! They whip up in no time! And I'm having so much fun playing with color! 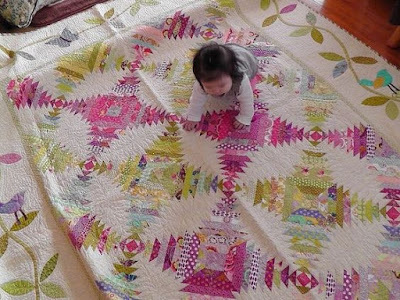 I have no specific plan of how big I'm going to make this quilt and in what layout I plan to put them in. But I do know that they're fun to make and I'll try to use up most of my leftover strips! If you want to sew-along with me, I am attaching the free Itty Bitty Log Cabin Block PDF pattern HERE. There are two on a page! Enjoy! Welcome to day 8 of the Wistful Winds Blog Tour! I am so happy for my friend, Shari Butler of Doohikey Designs. 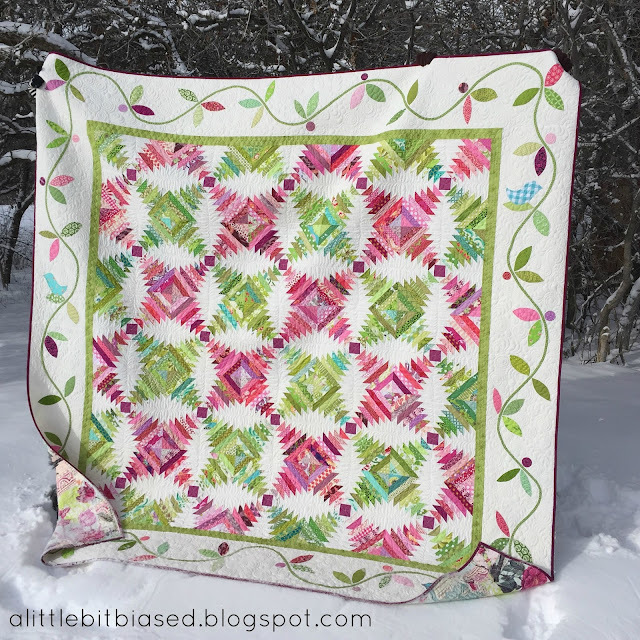 She recently came out with another beautiful fabric line for Riley Blake Designs called, Wistful Winds. And when she asked me to participate in the blog tour, I couldn't say no. It's such a cute line. Plus, Shari is so talented and has such a sweet heart! For my project, I decided to make my daughter a new apron. She had outgrown her other one (she's growing up so fast I can't even take it anymore! 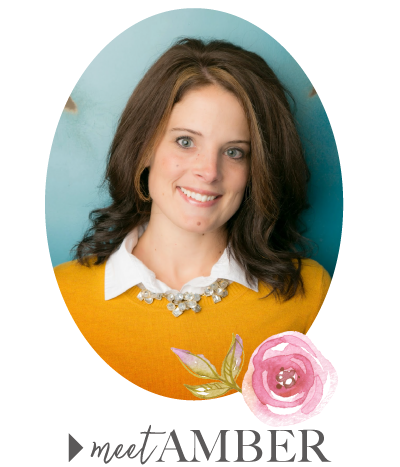 :) I thought I'd try out the free "Amy Apron Tutorial" by Esther from the blog Wholly Kao. 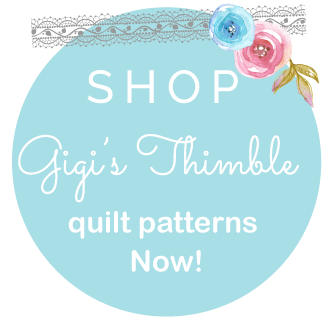 I've had it "pinned" on my Pinterest board, More Sewing, for a while now. I love putting my "pins" to good use, don't you? Esther's tutorial is really simple and easy to follow. I love the little pleats around the edge of the apron! I did tweak Esther's pattern just a tiiiiny bit. 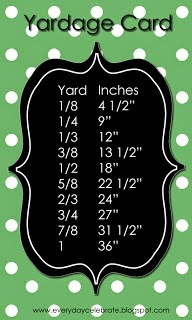 First, I used 3 fabrics instead of 2 (because I wanted to incorporate more of Shari's darling prints!) and second, I made two short neck ties rather than one strap that was secured on both sides. I wanted it to be adjustable for my growing daughter. I love the aqua stripe. I thought it paired well with the red floral but there are lots of other great prints in Wistful Winds that I wish I could have incorporated, as well. There are more florals, geometrics, dots and one with clouds and little girls holding flowers! So fun! My daughter chose the red floral and I think it was a great choice! She really loves how it turned out! 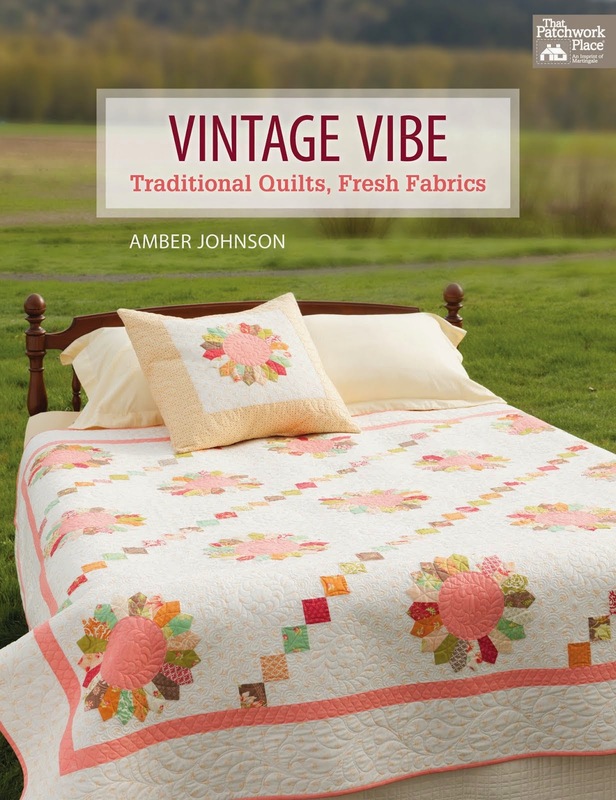 Thanks again to Shari for asking me to participate in the Wistful Winds Blog Tour. I had so much fun making this apron and playing with her sweet fabrics. Wistful Winds fabrics will be available in stores next week.